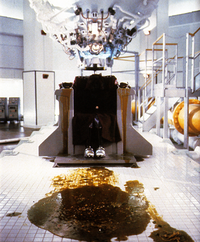 The Devo Chamber is a large, room-sized machine that President Koopa used to de-evolve criminals or those opposed to him in the Super Mario Bros. film. The Devo Chamber involves strapping people onto an automatic chair, binding them by the arms to prevent escape. Afterward, when the knob to the time period of the character's ancestors is set, the victim is reeled away before the chair is launched up into a de-evolution device, exposing the head to rays designed to forcibly de-evolve the person's head down to the size indicated. Koopa commonly uses this as a form of punishment. Koopa used this to create Goombas to serve him as a dumb, but loyal police force, as well as to reduce extreme offenders to primordial ooze. When he threatened to do this to Mario and Luigi, however, they turned the tables on him and subjected him to the process himself; though it ended prematurely, Koopa began to develop more reptilian traits from that period onward. Aside from this, he also used it as a form of execution where they are given a high dose of devolution radiation that turns them into primordial slime. This had been the fate of a technician worker after sneezing in Koopa's presence, due to the latter being a germophobe. Koopa later subjected Iggy and Spike, his loyal minions and cousins, to the Devo Chamber after becoming fed up with their stupidity and incompetence; however, he used the process to evolve them to the "Advanced" level, vastly increasing their intelligence. However, this backfired on him when Iggy and Spike, now able to think for themselves, instead turned on him and joined forces with the Mario Brothers to put an end to his rule. President Koopa converses with the King in Devo 4. "Devo 4" was a separate Devo Chamber where Koopa kept the King, who he has de-evolved into a giant sentient fungus. ↑ This was shown in a deleted scene, which was also kept in the junior novelization. Although the scene was deleted, the event was nonetheless implied in the final version due to the slime being present during the Mario Bros' revolt, where one of Koopa's henchmen slipped on it. This page was last edited on September 15, 2018, at 17:38.